Mercurii, primo die Julii, 15° Car. IIdi. 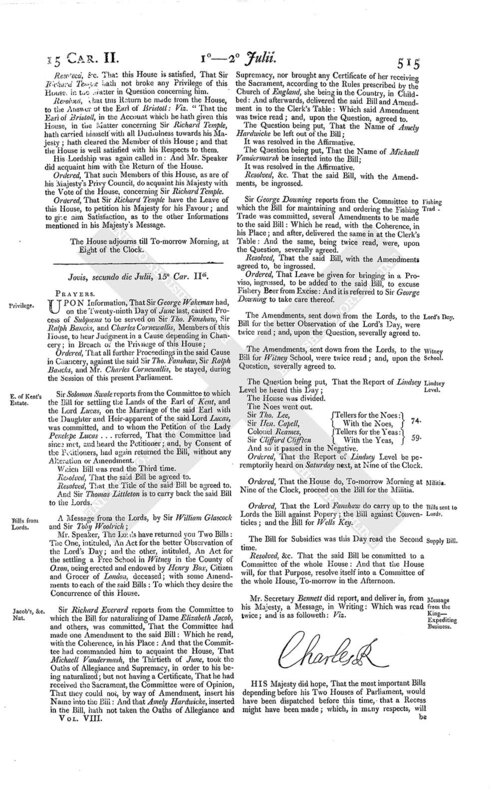 Privilege.-Charge against Sir R. Temple. AN additional Bill for the better regulating and collecting the Duty of Excise was read the Second time. Resolved, &c. That the said Bill be committed to Sir Thomas Gowre, Mr. Knight, Sir Tho. Allan, Sir Wm. Lowther, Mr. Yorke, Mr. Trelawney, Sir Tho. Meres, Sir Edw. Masters, Sir Edm. Pye, Mr. Buller, Mr. Rigby, Mr. Heath, Mr. Finch, Sir Edm. Pooley, Sir Lanc. Lake, Sir Solo. Swale, Sir Tho. Tompkins, Colonel Reames, Mr. Pepis, Mr. Collins, Mr. Jolley, Mr. Kent, Sir Wm. Doyley, Sir Rowland Berkley, Sir Francis Goodricke, Sir Wm. Thompson, Colonel Gilby, Mr. Clifford, Mr. Morrice, Colonel Windham, Mr. Jay, Sir John Newton, Mr. Knollys, Sir George How, Mr. Chetiwyn, Mr. Garaway, Sir Rich. Onslow, Sir George Downing, Sir John Nicholas, Sir John Norton, Sir Charles Cottrell, Sir Edm. Peirse, Mr. Whorwood, Sir Tho. Lee, Mr. George, Mr. Wandesford, Sir Bayn. Throckmorion, Sir Rich. Oateley, Sir Nicholas Steward, Sir John Fredericke, Sir Antho. Irby, Dr. Burwell, Sir Robert Howard, Sir Hen. Bennett, Mr. Jones, Sir Richard Everard, Mr. Moore, Sir John Birkenhead, Sir Courtney Poole, Sir Tho. Littleton, Colonel Strangwayes, Sir John Shaw, Sir Jeoffrey Shackerly, Colonel Kirkby, Sir Tho. Peyton, Lord Ancram, Sir John Holland, Sir Cha. Harbord, Sir Edm. Bowyer, Mr. Phillips, Colonel Fretchvile, Mr. Ashburnham, Sir John Gaudy, Sir Rich. Braham, Sir Rich. Temple, Sir Clement Throckmorton, Mr. Grey, Mr. Weld, Colonel Egerton, Sir John Duncombe, Mr. Fox, Sir Gilbert Gerrard, Sir Phillip Warwicke, Mr. Boscawen, Mr. Strangwayes, Sir Rich. Mauleverer, Serjeant Charleton, Mr. Windham, Sir George Reve, Mr. Whitley, Mr. Chowne: And they are to meet To-morrow at Two of the Clock, in the Exchequer Chamber, in the Afternoon: And to receive Proposals for regulating Abuses, and better ordering the Duty of Excise: And to send for Persons, Papers, and Records. 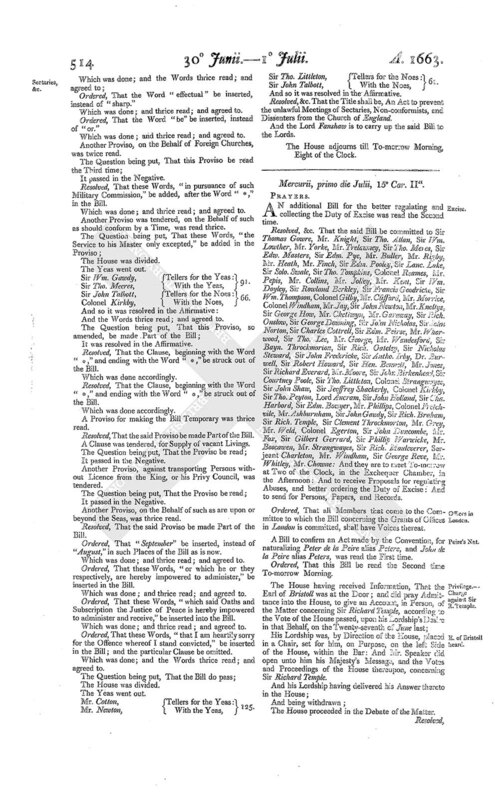 Ordered, That all Members that come to the Committee to which the Bill concerning the Grants of Offices in London is committed, shall have Voices thereat. A Bill to confirm an Act made by the Convention, for naturalizing Peter de la Peire alias Petere, and John de la Peire alias Peters, was read the First time. Ordered, That this Bill be read the Second time To-morrow Morning. His Lordship was, by Direction of the House, placed in a Chair, set for him, on Purpose, on the left Side of the House, within the Bar: And Mr. Speaker did open unto him his Majesty's Message, and the Votes and Proceedings of the House thereupon, concerning Sir Richard Temple. The House proceeded in the Debate of the Matter. Resolved, &c. That this House is satisfied, That Sir Richard Temple hath not broke any Privilege of this House, in the Matter in Question concerning him. Resolved, That this Return be made from the House, to the Answer of the Earl of Bristoll: Viz. "That the Earl of Bristoll, in the Account which he hath given this House, in the Matter concerning Sir Richard Temple, hath carried himself with all Duthulness towards his Majesty; hath cleared the Member of this House; and that the House is well satisfied with his Respects to them. His Lordship was again called in: And Mr. Speaker did acquaint him with the Return of the House. Ordered, That such Members of this House, as are of his Majesty's Privy Council, do acquaint his Majesty with the Vote of the House, concerning Sir Richard Temple. Ordered, That Sir Richard Temple have the Leave of this House, to petition his Majesty for his Favour; and to give him Satisfaction, as to the other Informations mentioned in his Majesty's Message. The House adjourns till To-morrow Morning, at Eight of the Clock.